This doesn’t just highlight the inadequacies of the DWP and welfare in general but also the inadequacies and underfunded mental health services within the NHS. It reveals how little is being done in support of people with mental health difficulties and how the Conservatives aren’t taking mental health seriously. No wonder the UN is investigating whether the welfare ‘reforms’ carried out by the Conservatives comply with Human Rights. Why are people that you know are at risk of self-harm and/or suicide not receiving the support they clearly need? Why are those at risk not receiving the benefits they’re entitled too that is causing these scenarios that you are being ‘responsible’ in ‘preparing’ for? Why are you allowing it to get to the stage where someone at risk is being denied support that you’re having to ‘prepare’ staff at the end of the application process to deal with? Why are staff with no medical qualifications at the DWP the ones that are dealing with delicate issues surrounding mental health? How can you justify the life of a *vulnerable* human, being in the hands of unqualified staff? Why isn’t there support in place to stop people from slipping through the cracks, where they are being denied the support they need and are entitled too? Why aren’t mental health services being properly funded to meet with the demand? 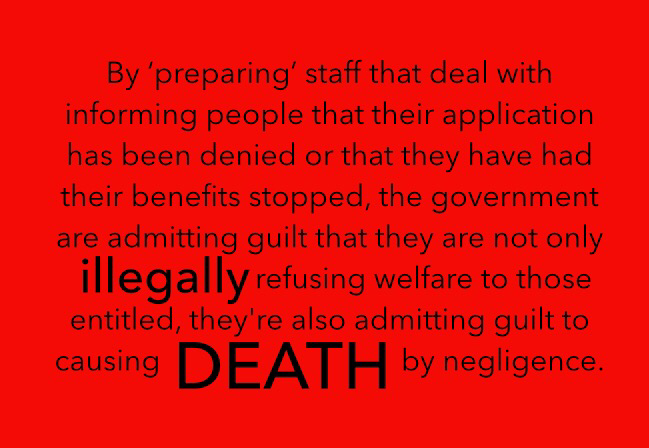 By ‘preparing’ staff that deal with informing people that their application has been denied or that they have had their benefits stopped, the government are admitting guilt that they are not only illegally refusing welfare to those entitled, but also admitting guilt to causing death by negligence. Also, it isn’t just the wellbeing of welfare recipients but also of the DWP staff, people that, it could be argued, are only trying to get on in life and make a living. These people are being subjected to traumatic experiences of those going through traumatic experiences, these people shouldn’t be in a position of not only having to inflict pain and suffering but also then be the ones that have to deal with the repercussions. These staff are powerless in most cases, forced to meet targets, forced to inflict suffering, forced to follow guidelines set by people far from the action that set the rules but then leave others to deal with the ramifications. Having seen undercover documentaries, read first hand accounts, and from my own experiences with the DWP, of the culture, attitudes and general ethos of DWP staff, it is hard to feel sympathy for some of these staff. Staff that seem to revel in the destruction they cause, that seem content to trick people, that don’t seem to care about the consequences of their amoral actions. But this culture comes from up high, these attitudes are drilled into people from their very first day, this ethos matches that of IDS, our Conservative government and of our mainstream media. It isn’t that every member of staff at the DWP is heartless, some are just trying to earn a living, some are affected by what they’re forced into doing, some do bravely blow the whistle and try to expose what is going on. From my own experience of the DWP a lot of the people I spoke too did seem to care but had their hands tied, they were either untrained or powerless to do anything because of the constraints set from up high. I have spoken to some that seem to have been brainwashed either by the government and mainstream media ‘scrounger’/’fraud’ rhetoric or by the training they received/untrusting and un-empathetic attitudes drilled into them, or possibly a mixture of these or they’re just a callous and ignorant individual. I had previously provided a whole array of various medical assessments from many and various different medical professionals, occupational therapist assessments, even several assessments done by the DWP, medical test results, a whole heap of ‘proof’ that this individual would have had on his computer screen. I can’t begin to tell you how it felt to be judged in such a way, to place your life, your future, in somebody’s hands and have them be entirely indifferent to whether you lived or died, entirely indifferent to whether you lived with just a little dignity or with nothing, whether you received just a tiny amount of support to help with all the traumatic pain and suffering or whether you were damned to continue to suffer and for that suffering to worsen, to have them not have any compassion or have any care for you, to have everything you had been through dismissed in an instant, to be in desperate need but have that need ignored, to know straight away that you wouldn’t be heard, you wouldn’t be able to receive the help you desperately needed, I can’t tell you the sheer magnitude of what he said to me or of the consequences that his actions had. If it wasn’t for the support of my fiancée, the two seconds it took for him to destroy me, heartlessly dismiss and in doing so destroy my present and future, to belittle and condemn me, without my fiancée I wouldn’t still be here, that individual has no idea that he could have caused the death of a fellow human being, he may as well have been stood right in front of me at that moment with a knife in his hand to stab me repeatedly, if it wasn’t for my fiancée then that is exactly what he would have done. But, that being said, it would be wrong of us to assume that the majority of staff are like the individual I encountered, it’d be wrong to assume that the majority don’t care, it’d be wrong to blame the staff for the actions of our government and mainstream media, actions that will effect the wellbeing of staff that are a mere tool, and also victim, of oppression. The latest revelations at the DWP are merely papering over giant cracks rather than trying to sort or solve the many and vast underlying problems. Problems that they are purposefully creating. This latest revelation proves the government know their policies will cause horrendous suffering, they know that people will die due to their actions, they know that people already suffering will suffer more, they know that their policies will cause people to self-harm and will cause people to end their lives. 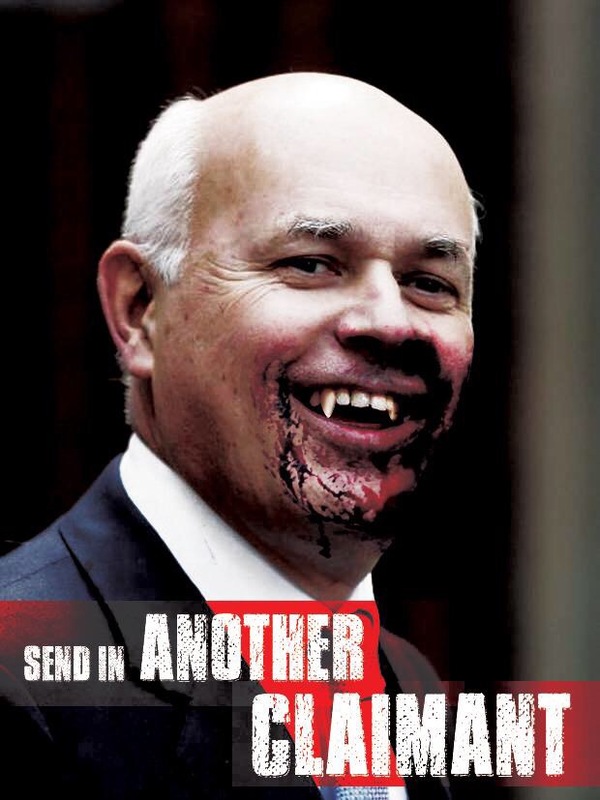 This should be proof enough for changes to be made, for Iain Duncan Smith to be forced to resign (please click here or here for a petition to try and make this happen), this should be proof enough for opposition parties to demand an inquest into government policies, into the attitudes at the DWP from up high being passed down and forced upon staff. This should be proof enough for opposition parties to demand an inquest into mental health services and into the attitudes towards mental health from the Conservatives. This should be proof enough that change has to happen now before anyone else goes through further suffering, before anyone else self harms, before anyone else dies from destitution or from ending their life because of the suffering and destitution that is being inflicted upon them. 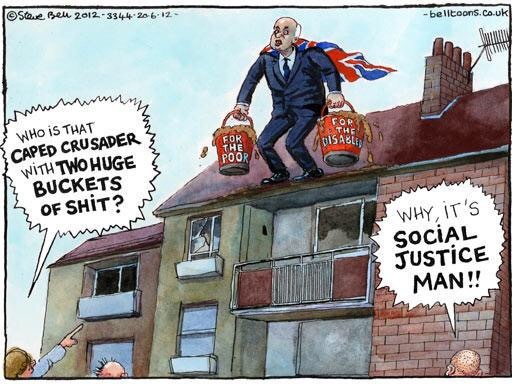 The only reason the government and mainstream media inflict such suffering and hardship is to enhance the wealth and power of the already wealthy and powerful, they’re doing this through policies that go unnoticed while they engineer and focus societies anger on non-existent ‘scroungers’ and ‘frauds’, to pit people against one another, to create a judgemental ‘blame the individual’ dismissive and oversimplifying culture, to increase competition at the bottom of society, to force an attitude of ‘working hard’ and ‘doing the right thing’ to make people accept low paid, low hours and insecure jobs. They’re destroying and ending the lives of those already suffering to shift even more wealth from those that have the least to those that have the most. They don’t care about the consequences of their actions, they’re playing society, manipulating and brainwashing society, and society is playing exactly to their tune. We shouldn’t necessarily blame the oppressed and controlled, humans are to an extent amenably docile, tractable, and malleable, this control has been exerted since birth by a ruling elite with vast know how, resources and means. But, despite this, it could be argued that those controlled are also to an extent complicit. We should blame the oppressors, the ones controlling society, they are the ones that we must challenge. Please also read this, this, this and this, and also please sign this. Thank you. Please share to Facebook and Twitter, follow this blog and follow on Twitter PoliticalSift. Next: Next post: What does it mean to be ‘fit/unfit-to-work’? And when DWP staff suffer from PTSD and are let go then they will understand! violence intensified following Bouazizi’s death, leading then-President Zine El Abidine Ben Ali to step down on 14 January 2011, after 23 years in power. I am doing a lot better now, no thanks to the DWP, but because of some health professionals that actually took the time to get to the bottom of my physical problems rather than just passing me along to the next so called ‘specialists’. I still have fairly severe and complicated physical problems but no where near as debilitating as they once was. And also thanks to a supportive partner and family that unfortunately many are not so lucky to have. Mentally I’m still ill, but again better than I was at the time that I had that unfortunate experience with the DWP, one of many fairly traumatic experiences I had with them. I still need help that the DWP is not forthcoming with, but I don’t need ‘as much’ help as some, that I really do fear for. But saying that I don’t need ‘as much’ help is part of the ludicrousness of this whole thing, those desperately in need don’t receive the help they need and then those like me that would be considered ‘less in need’ are entirely abandoned also, we don’t exist in the minds of society, I’m in a similar situation to this individual – https://politicalsift.wordpress.com/2015/08/21/dont-be-fooled-by-the-helping-those-most-in-need-rhetoric/ – in a lot of ways, I feel guilty asking for help because I don’t need ‘as much’ help as others and I feel that I’d be taking that help from those ‘more in need’ if I was to get help, if that makes sense. Anyway I’m going on a bit of a whinging ramble now so I’ll stop! Thanks for your comment, make sure you check out my other blog posts, not all written by me! Thank you. they have created a virtual concentration camp. One that does not require dogs and 24hr guards. I do not sign up for this when I pay my taxes. I expect everyone in the UK (and in fact the world) to be treated with dignity and understanding. But as a contributor to the UK system I do not want people being treated like this in my name.this is cruel, I humane and down right wicked!